During the past 2.1 million years, three massive volcanic eruptions—eruptions often referred to as supervolcanoes—have changed the face of the Greater Yellowstone Ecosystem. The first one, termed the Huckleberry Ridge eruption, occurred about 2.1 million years ago. It was centered in what is now the western portion of Yellowstone National Park and extended to the area around Island Park, Idaho. The volume of volcanic rock produced by this eruption was about 2,400 times that produced by the Mt. St. Helen’s eruption of 1980! About 1.3 million years ago, the second great eruption occurred in the western portion of the first eruption, near Island Park. The caldera left behind is referred to as the Island Park Caldera. It was the smallest of the three great supervolcanoes. The third and most recent massive eruption occurred about 640,000 years ago in roughly the same area as the first eruption. It was a bit smaller than the first, but larger than the second eruption. The caldera created by the most recent eruption is referred to as the Lava Creek Caldera and largely overlaps the Huckleberry Ridge Caldera. Although there have been no massive, supervolcano eruptions in the Greater Yellowstone Ecosystem in the last 640,000 years, a vast magma chamber containing molten rock remains active below Yellowstone’s surface. Grand Prismatic Spring, one of nearly 10,000 geothermal features sitting atop the vast magma chamber underlying Yellowstone National Park. Photo by C.R. Preston. Including the Yellowstone supervolcano field, there are about twenty supervolcanoes spread across the globe. If one of these supervolcanoes erupts, it would send gases, solid debris, and magma high into the atmosphere, dramatically changing Earth’s climate—possibly creating another Ice Age. Scientists are studying the Yellowstone magma chamber and other similar areas across the world to better understand what causes supervolcanoes to erupt, and how to predict those eruptions well in advance. 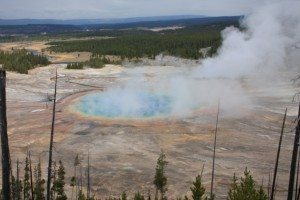 Recent discoveries reported by scientists at the University of Utah at a 2013 meeting of the American Geophysical Union indicate that the magma reservoir underlying the Greater Yellowstone Ecosystem is more than two times larger than had been previously thought! There is no indication that the reservoir is growing, but technology and our ability to measure the reservoir has improved. Scientists believe that we would have a warning long before a supervolcano eruption. The ground would bulge perhaps hundreds of meters in response to increasing pressure from below. 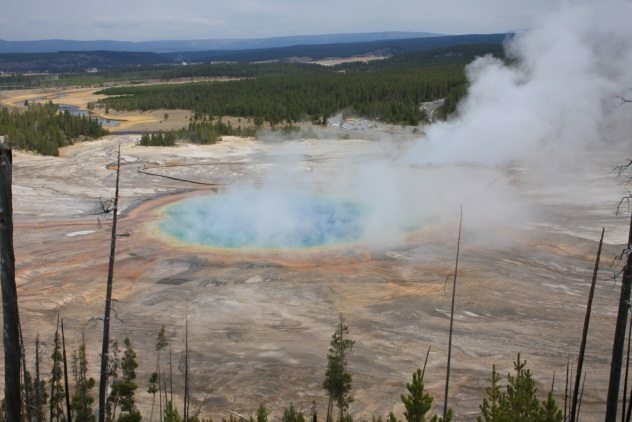 The recent siesmic activity that Yellowstone has experienced is not evidence that a Yellowstone supervolcano eruption will occur anytime soon. For more information and breaking news about the Yellowstone supervolcano, or other topics related to geology, ecology, or wildlife of the Greater Yellowstone Ecosystem, keep visiting our website or plan to pay a personal visit the exhibits of the Draper Natural History Museum at the Buffalo Bill Center of the West, in Cody, Wyoming.